My name is Shari and I play goal ball. 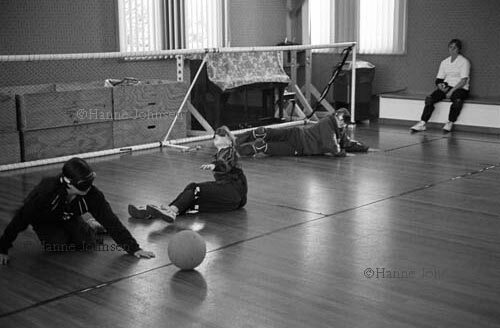 Goal Ball is a really fun sport. It's for people with visual impairments. This sport is really fast paced; the players move around a lot. Each player is blindfolded so they can't see, but you've got to listen. The ball has a bell inside it. The ball used in goal ball is similar to a basketball – except they are REALLY hard – and heavy too! The game is played indoors on a court that is set out like a netball court, only the goals are like soccer goals. A goal is at each end, and there are three players on each side – a centre, left wing and right wing. One team throws the ball and it rolls across the ground. The other team has to hear it and try to block the ball from getting into the goal. Remember that the players are blindfolded - so it's really difficult. The players feel their way around: there are spaces marked out with tape that they can feel to know their position on the court. They jump around a lot when they are defending. Sometimes players have to dive across the ground and it hurts if they get hit by the goal ball because it is really hard! Then the players only have ten seconds to throw the ball back again. Each game is ten minutes each way, with a half time in the middle. The players move round a lot, and have to communicate with their team members. So it's quite noisy, but the crowd's got to be completely silent so the players can hear the bell. There are a number of adult teams around New Zealand, but Christchurch is the only one with a junior team, with children playing. Even though I'm in the Junior team, I got selected to go to Auckland at Labour Weekend this year to play in the National Champs with the women's team! There are lots of rules – like you can't touch your goggles, and you can't throw a high ball, which is above the knee. If you do, you've got to defend the goal by yourself. The goggles are like ski goggles with tape on them and the players wear them to make it even, so that people with a little bit of sight don't have an advantage over people who are totally blind.